We've been successfully using Codeship and Stackdriver for the last few months. If you haven't hear of these two Boston companies I would seriously consider taking a closer look. Stackdriver has grown up fast and provides very compelling monitoring-as-a-service product that integrates seamlessly with AWS. They were just acquired by Google a few months ago -- congratulations to the whole team! Codeship provides continuous-integration-as-a-service, we’ve been using them as our build/test/deploy server -- we consistently run 400+ builds a month. I really feel like we have saved time and money by leveraging these two great, as-a-service, products. The uptime, quality, and support has been really amazing from both of these companies. I can't wait to see what they do next. One thing we did that I think is interesting, we connected the continuous integration process, provided by Codeship, to the system monitoring of Stackdriver. The main advantage being; we see information about what, when, where, and who deployed within the system monitoring display. This enables us to gain insight into our system, especially when things go wrong. You can follow the steps below to enable Codeship deploy events in Stackdriver. Please feel free to email me or post questions in the comments below. Create a new API key in your Stackdriver Account Settings. Use the API key to update the deploy-event script. Add the the following python script (deploy-event.py) to your source repo git. This should be the same repo that is configured in Codeship. Make sure to use the API key from step one to replace <YOURAPIKEY>. Add the following bash to your Codeship deploy script. You can change the DEPLOY_ENV to stage or prod. 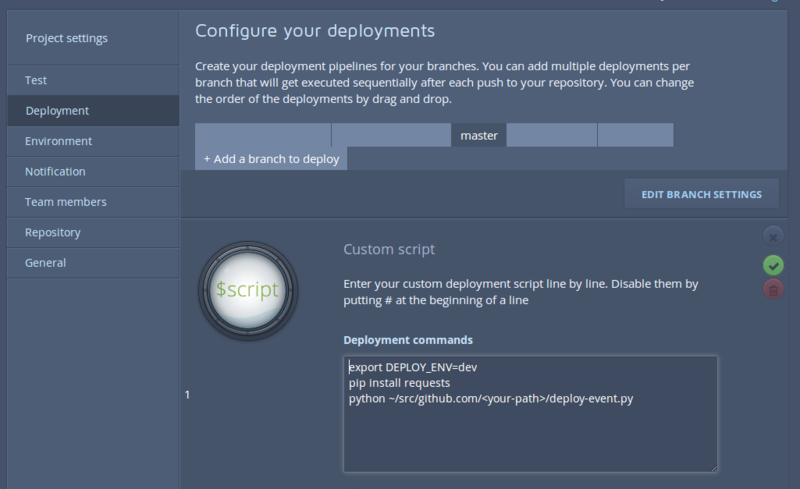 Moreover, you will need to replace <your-path> with the path to the deploy-event.py. This is how it should look if you add it to master branch. You should be all set after this. Next time you push a commit to your branch, in this case master, you will see airplane icons above your charts.